It's not your lack of skills, but the recently discovered hidden subconscious sabotage programs that create inhibiting belief systems that block your success in life. Many good books have been written about developing the skills to make money. However, reality shows us that the average reader is able to apply only 25%, or less, of all the good advice and techniques provided. He or she might totally agree with the other 75% of the information but seem incapable of applying it. 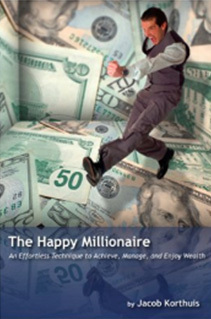 The Happy Millionaire will show you why you are sabotaging yourself and why you have not been able to change that so far. Connecting the facts of the latest findings in psychology, biology, neuroscience, physiology, and quantum physics made it possible to create an entirely new technique, called Progressive Mental Alignment ® (PMA). By reading The Happy Millionaire, you will find out how to discover and overcome your hidden sabotaging programs permanently. PMA will provide you with powerful tools to trace the hidden sources of your inhibiting belief systems and transform them into inspiring energy. This will enable you to use all your hidden power, qualities, and skills to reach your highest potential in every part of your life. You will not only achieve prosperity; you will also know how to use it, hold on to it, and enjoy it to its highest degree. This book is a huge, exciting journey into your hidden capacities! Interesting book to read if you want to make more money ;) But that’s not what it’s all about. It will help you to find what’s blocking you now to become a better you. To get more self confidence and be happier in life! Which will result in better business.